Searching for Bonobo in Congo » Why so few elephants along the Lomami River? It certainly is not drought that has chased the elephants away. The forest is plenty wet even though it is dry season. So where are the elephants? Between the Lomami and the Lualaba Rivers, there is a load of swamp forest. The teams come back with foot rot every time. During the rainy season, starting end September, large areas are just impenetrable. In the Ituri forest Okapi Reserve a few months ago, I saw the wide trails where elephants trudge again and again through swamp forest. But here, between the Lomami and Lualaba, no “elephant roads” at all. Further south there is less swamp forest. There are even rivers that are empty or nearly empty, even though many rivers will become impassable once the rains get underway. But still no elephants. Although there is almost no elephant sign between the Lomami and the Lualaba there are lots of forest buffalo. Why one and not the other? The only reason that makes sense to me is poachers looking for ivory. On the west side of the Lomami, between the Lomami and the Tshuapa, there is more elephant sign but even here very little in the south near the savanna. At the last camp, our most southern base, I talked to elders and the local administrator about elephants. All told me that they had been wiped out in 1997 and 1998. These were the years when civil war swept through Congo. War did not reach the mid-stretches of the forested Lomami, but rebel soldiers ran over the savanna border in the south. They came through with automatic rifles; the AK 47 is a popular elephant-killing gun in Congo. The administrator at Katopa told me that the elephants had been chased north. Maybe, but maybe the soldiers just wiped them out. It is strange because in so many other ways this forest seems hardly hunted at all: There are hundreds of red colobus between the Tshuapa and the Lomami and they are usually one of the first primates hunted out because they are so large and slow to flee. Yesterday I walked just a couple of kilometers to an area I had spotted on the satellite image. When there were elephants here, it must have been a mineral lick or baie. Now it is all overgrown. But on the short walk there and back I saw three troupes of monkeys, heard heaps of others and saw an unbelievable quantity of antelope dung heaps. 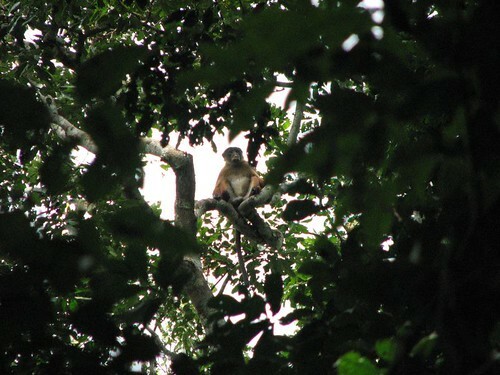 And also lots of sign of bonobo eating. This is really amazing forest. It is just the elephant that is missing, — but still present like the memory of someone who has only just left. Ok, my hot bucket bath is ready. Luxury!! 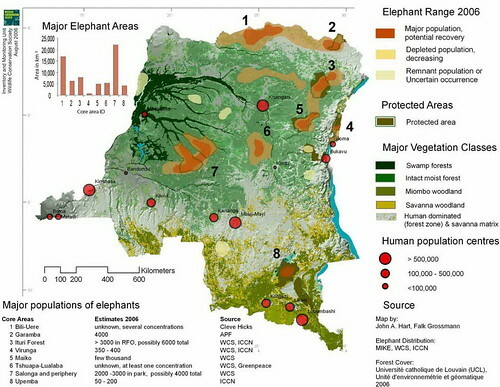 Take a look at this map of elephant distribution in DR Congo. The estimate for Tshuapa-Lualaba (6), including right where Ashley is now, was “unknown” but it was assumed that at least one good population existed. Ashley did see fairly good elephant sign in one area but these populations have been more depleted and are in more danger than we had guessed. For more information look at the African Elephant database — the status report, starting on page 26. This entry was written by Terese Hart, posted on 2007-08-11 at 5:43 am, filed under Elephant. Bookmark the permalink. Follow any comments here with the RSS feed for this post. Post a comment or leave a trackback: Trackback URL. Thanks for all this infos. Hope everybody comes back healthy. When the next state of the exploration starts – get we also detailed infos then? Have you discovered the okapi? we have indeed discovered okapi and the next post will indeed summarize what we have found out about distribution of okapi. It is more extensive that previously suspected. After this Lomami trip there are three areas that need exploration in the same large 50,0000 km2 block : upper Tshuapa, Lower Lomami-Lualaba and one area that Ashley could not get to (because of rapids) in the upper Lomami that we will have to come in to from Maniema. We have funds for the first two and are looking for funds for the third (and have had some excellent help already). After those steps (which if all goes well will require another 6 mos to completion) then there will be the inventory. We want to continue posts throughout.